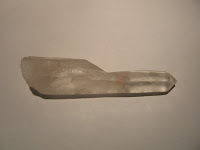 Dimensions: [L] 4.8" [W] 1"
Record Keeper crystals have clearly etched pyramid shapes on its side or sides. Sometimes these shapes are separated so that the face is covered with triangles others show only one. 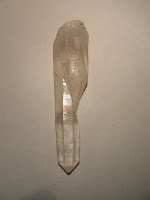 some are grooved like chevron patterns deep into the crystal. 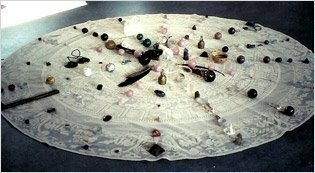 Record Keepers hold the imprint of all that has gone before and are portals for spiritual wisdom. Discrimination and integrity are needed when working with a record keeper. 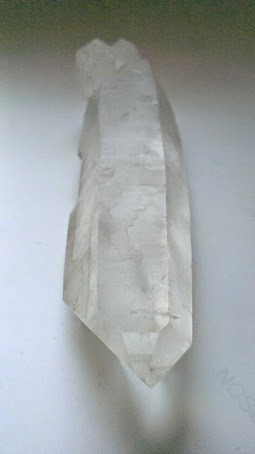 Placed with a large triangle on the 3rd eye this crystal can be meditated with to access the personal or collective past or re-attune to your own wisdom, and to facilitate insights for evolution. The crystal can be held and gently rubbed with the finger over the pyramid, this wil "open the book"
Record keepers are an excellent way to explore your inner self. They can act as a catalyst for growth and aid in removing obstacles to progress. Re-energizing your whole being, they can prevent burn-out.